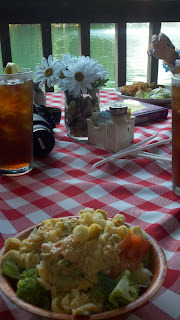 After our breakfast stop fiasco, I was nervous about the place I was planning to review at lunch time. When we got off I 95 in Ridgeland, SC I became increasingly more nervous as OnStar began taking me into a cluster of motels and gas stations. This place was supposed to be lakeside. I don't see a stinkin' lake. I saw some signs for Blue Heron Nature Trail, which was another place I planned to check out. 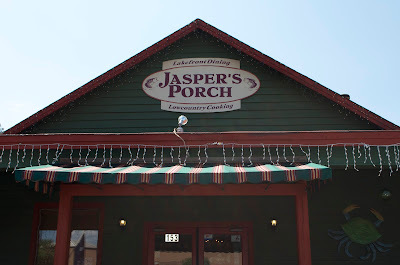 Then I saw the sign for Jasper's Porch. Here we go. I must say, I breathed a sigh of relief when this place finally came into view. Yes, it is actually surrounded my motels, but it was CUTE! And on a lake! 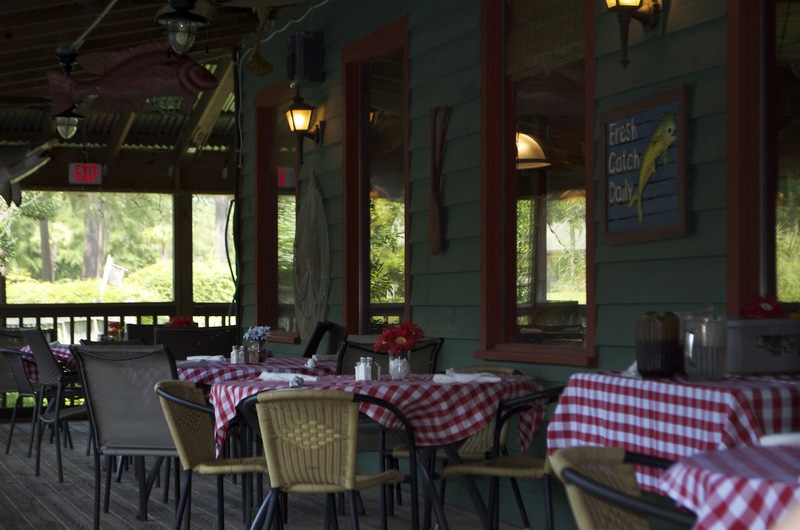 This restaurant actually sits on the Nature Trail, which is about half a mile around-- perfect for stretching your legs after a long car trip! 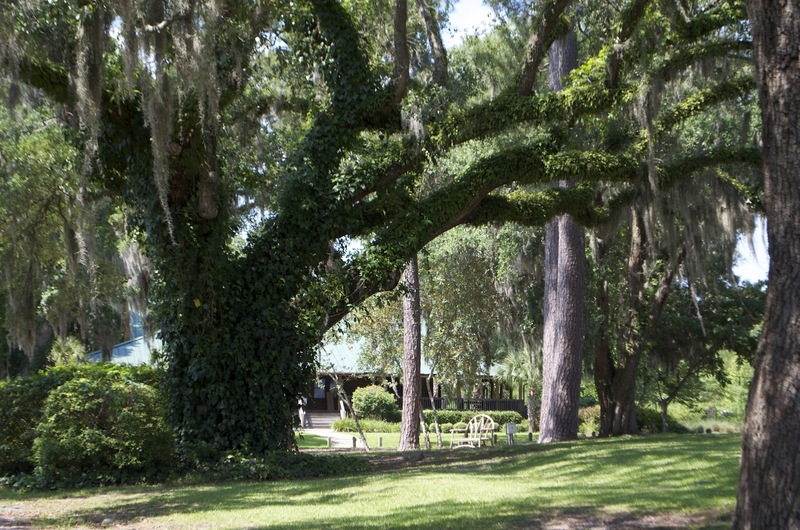 The area is lovely and full of wildlife (even alligators). The restaurant is adorable. Right away it made me feel like a guest, just coming to have a meal on a friends porch. The decor is rustic-chic and so very comfortable. There is indoor seating, most with lake views, but of course we sat on the porch! Well, we don't make stops off the highway just for atmosphere. We gotta eat, too! 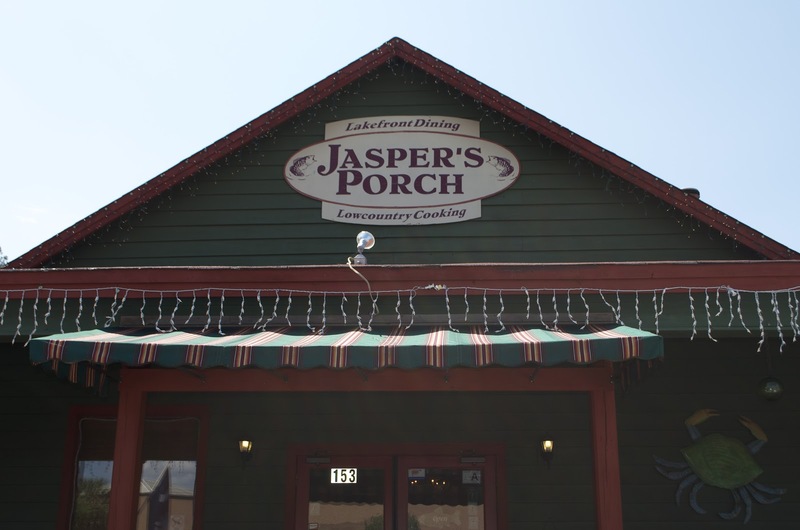 The menu at Jasper's is limited. If you like good ol' southern (low country as the sign says) cooking then you won't have any complaints! Two of my daughters are vegetarian and it was slim pickings for them. They ended up filling their plates with veggies from the buffet. The veggies prepared without meat, that is. They ate a lot of lettuce. My youngest daughter got her fill of fried chicken. She was quite happy about that! I ordered a salad and soup combo-- salad off the bar and a she-crab soup. My theory is they do a few things well...but VERY well! The salad bar was meager, but the seafood pasta salad was incredible! My she-crab soup was rich, but not too rich. It was flavored with sherry, but also had a little spice to it. It was delicious! No meal is complete without dessert, and I am happy to report that Jasper does coconut cream pie very nicely. The coconut was toasty, the crust flakey and the cream...well, creamy, sweet and luscious! All of these features, combined with the friendly staff (Wendy was our server and she couldn't have been sweeter! ), we will certainly return!